Today we met up with Gabe to hangout for a bit...as a family. To be very honest I've been sorta avoiding him and the whole step family issue since our last meeting. I wasn't sure if I wanted that. To be a step family. With him. After meeting up we headed to the park. 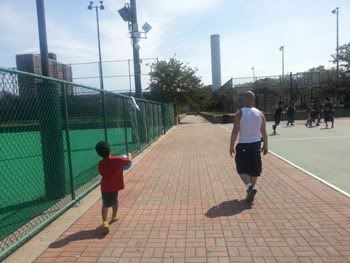 It was nice day to let my son run around while I discussed the future plans and goals. This would also give me a clue how Gabe and Daniel would interact. I will spare the hours of details but it was clear to me that Gabe wasn't there to "be" with us. In truth after spending all those hours together I wasn't sure why Gabe came to meet us. The step family issue has finally been settled. For now Daniel and I will remain a family of 2. So my sister was cleaning, listening to music and singing. Very off key. For some reason my son decided to join in. Maybe he thought they could harmonize? The song? 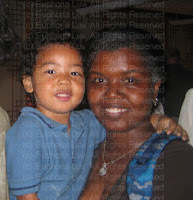 I'm Goin' Down by Mary Blige which came out way before my son was even a thought. The fact that he's trying to learn the words and sing the song blows my mind. So how did his duet do? Not very good but he tried. He was even getting all in it. Gotta give him an "A" for effort right? At least he picked a classic. I'm 4 years into this parenting thing, and one thing I've come to learn, is that parents are wish granters. We'll do whatever it take to make our child's dream come true. I think that is as it should be. 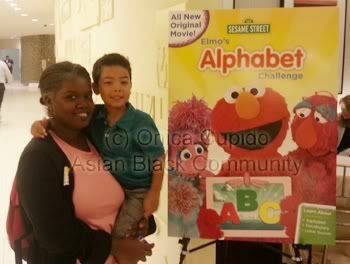 I recently had a chance to make my son's dream a reality when I was invite to preview Elmo's new DVD and meet him after. 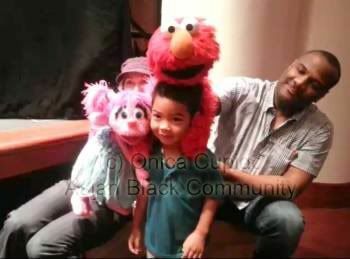 Now in full disclosre I wanna mention, my son hasn't had a personal meeting with Elmo, while I have met Elmo a few times. 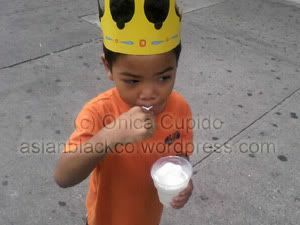 It's one of the perks of my other life as a semi famous mom blogger. But these perks are hard earned. I've put many long hours into blogging, getting my presence out there and connecting with dream companies like Sesame Street. Meeting Elmo isn't as easy as it seems. But I do what I have to because I know my son loves Elmo. Heck I love Elmo. And our love was rewarded. 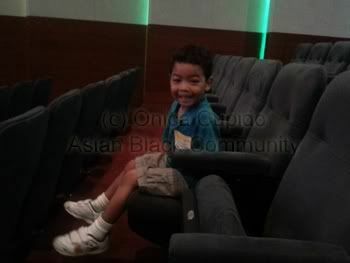 My son was beyond excited, as we headed to theater reserved just for the small group of families invited to the screening. As he sat in his seat, he asked me about a zillions times when the movie will start. 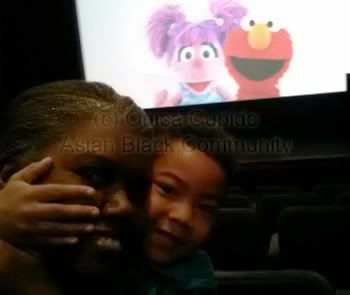 When the movie finally started he quickly hopped into my lap giggling with excitement. Watching Sesame Street is something we've always done together. 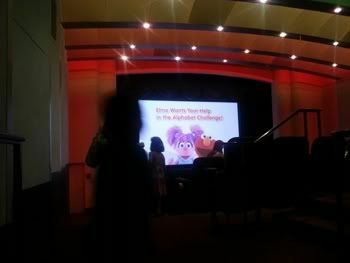 After the screening, Elmo and Abby popped on stage and the kids went wild. At this point I should mention that I'm the only black mom at this event. The only one. I share this so you understand the next series of events. 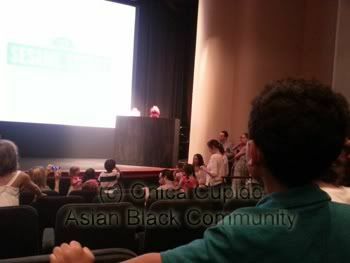 As Elmo and Abby tell us about their new movie, these little white kids lose their minds and rush the stage. Their parents aren't far behind and the battle starts so their kids can get access. I just sit and watch the craziness from the comfort of my seat. My son watches with me. We're not fans of crowds. 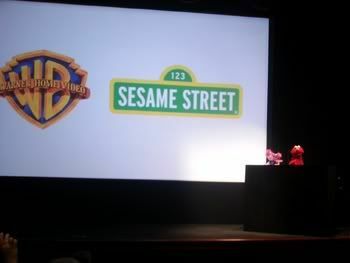 At a certain point they announce it's time for the meet and greet with Elmo and Abby. They clearly said for everyone to sit in their seats and they'll call families by rows. That plan soon went out the window when children start having melt downs and their parents allow it. No explaining about waiting, no taking turns, no common courtesy. The white privileged mindset at work. One women followed her crying child down the stairs and tries to skipped everyone. She loudly explains her child loves Elmo so much and wont calm down until she meets him. Can her child just go first? At this point I start to see red... and my skin starts to turn green. My she-hulk personality in mom mode is a dangerous thing. The thought in my head....Is her child any better then my son? Does her child love Elmo more then my son? Did this mother work any hardier then I did? Why should they be allowed to skip ahead?! They shouldn't and I wont let them. I explain to my son it's our turn to meet Elmo, pick him up and practically leap down the rows towards the meet and greet line. I make it there a split second before another mom. 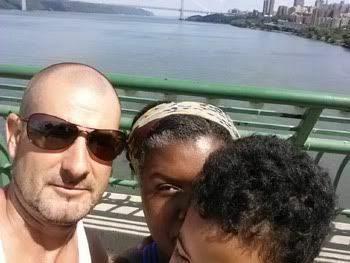 Did I mention I was the only black mother there. Of course she wasn't pleased. Neither were the other moms lining up behind. I didn't care. I looked at my son and repeated, it's our turn to meet Elmo. What followed was a parental battle of wits to see who would make it to Elmo first. This mom tried sneaking past me with her 3 kids but I held my position. I moved directly in front of her and blocked her advance every time. I worked hard to get to this moment. My son will have his Elmo experience. On time. Not after. 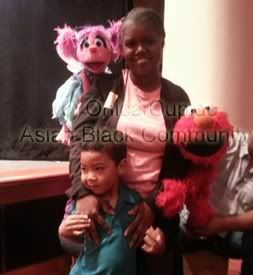 When it was our turn to meet Elmo and Abby, I breathed a sigh of relief and satisfaction. My job was done. My son would meet Elmo. 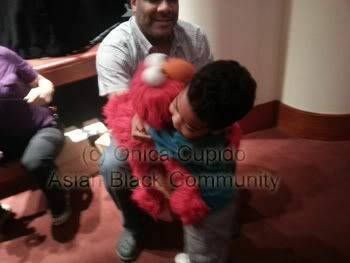 As I watched my son pose for photos and give Elmo a hug, my heart was filled. It's not everyday a child gets to have experiences like these. Many children will never get to do all the things my son does. Many children won't have their dreams come true. I know what it's like to be a child and not have your dreams come true. Now as a parent, I want different for my son. When I can, I'll work hard to make his dreams come true. Because dreams are made to become reality. My parents didn't raise me to think this way, I learn this life lesson the hard way. But I want my son growing up with this mindset. I want him to understand whatever he can dream about, he has the power to make real. Meeting Elmo is just a start of me proving this point.